In 2000, Janet Wong's book The Rainbow Hand: Poems about Mothers and Children was named an honor book for the Lee Bennett Hopkins Poetry Award. This award is granted annually to an anthology of poetry or a single volume poem published for children in the previous calendar year by a living American poet or anthologist. Awards are a great way to find your way to "new" authors, or at least new-to-you authors. This book is how I found my way to Janet Wong's poetry and picture books. Before I talk about some of Janet's work, let's learn a bit more about her. Janet: I heard Myra Cohn Livingston speak at an all-day seminar at UCLA Extension; right away, I knew I could learn something from her. But I didn’t want to write poetry. I wanted to write picture books for the very young, like my books BUZZ and HIDE AND SEEK. After a couple dozen rejections, I decided that I should learn to use a poet’s tools -- rhyme, repetition, and rhythm – to sharpen my prose. Janet: I was browsing through a children’s bookstore, looking for a gift for my young cousin. The next thing I knew, I had an armload of picture books that I wanted to buy – for myself! I was a lawyer at the time, and wanted to do something “more important” with my life. Writing books for children struck me as both an important and fun way to spend my life. Janet: After Myra Cohn Livingston scolded me for not reading enough, I started going to the library weekly with a huge backpack which I would fill with poetry, cleaning out sections of the 811 shelf, dozens of books at a time (in alphabetical order). I started at A (Adoff) and by the time I was at K (Kuskin), I was hooked! Janet: Myra believed in teaching forms and meter. Each week we focused on a different form (tercets, sonnets, tanka, villanelles), with exercises in meter and voice. It was a wonderfully disciplined approach to learning poetry. Janet: With poems, you can capture the little bits of memory and story and observation that give life flavor. If novels are the meat of creative writing, poetry is the pepper and salt. Janet: My 20th book, a picture book called HOMEGROWN HOUSE, is coming out this July. My “favorite book” changes all the time, as I imagine a mother’s favorite child changes weekly. (Having only one child, I have an easy time there!) My current favorite is A SUITCASE OF SEAWEED, originally published by Margaret K. McElderry. It went out of print a few years ago, and I brought it back last fall as a BookSurge reprint available through amazon.com and Baker & Taylor. My first book, GOOD LUCK GOLD, represented all the zeal and uneven raw emotion of a first book; A SUITCASE OF SEAWEED, being #2, is more relaxed and subtle, while still including poems about people and things that are extremely important pieces of who I am. My recent poetry collections, such as KNOCK ON WOOD: Poems about Superstitions and TWIST: Yoga Poems, represent a completely different type of work. They are riffs on their subject matter, and while they were great joys to research and write, they aren’t “part of me” the way the early books are. Janet: I’m working on too many books – and not finishing enough of them! Recently I did finish something that I’m pretty excited about, but it’s not poetry. It’s a silly picture book about an octopus, Luna, who could be the poster creature for today’s multi-tasking, busy, active child. My story introduces Luna in a classically existential way, as the sum of what she likes to do: bounce, splash in the bath, eat cookies, paint, watch TV. Then the new existentialism enters: we are what we own (or what we want to buy). Luna covets a Kiti toy so much that it takes control of her being. By the end of the story, the essential elements of Luna’s bouncy, splashy, artistic self get her the toy she wants, plus a few minutes of fame. I wrote this text to fit the art of a friend, Sladjana Vasic, whose Luna character has great child-appeal! Janet: Myra Cohn Livingston. Then a bunch, including: David McCord, Eve Merriam, Lilian Moore, William Stafford. Janet: Years ago, Margaret McElderry told me: “The problem is you want to make a living from writing.” And what a problem, today more than ever! Margaret was a terrific editor, brutally honest but encouraging. She kept me as one of her handful of authors after she went into semi-retirement. The others that she kept were all Super-Writers like Susan Cooper; I think she kept me just to keep me from making trouble. Janet: J. Patrick Lewis. With his grueling schedule of school visits, Pat is creating thousands of poetry fans each month. He has a special talent for writing about unusual themes that expand the poetry universe and grab the most-reluctant readers, such as his short gravestone poems (ONCE UPON A TOMB) and Guinness records-based poems in THE WORLD’S GREATEST. We often speak at the same conferences and schools, and I love following his lead; he gets a crowd so excited about poetry, they then love any poem I read. 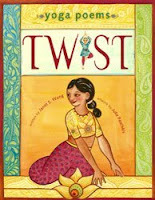 Two of my favorite books of Janet's were illustrated by Julie Pashkis. 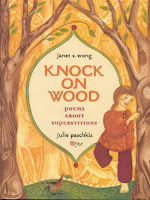 Knock on Wood: Poems About Superstitions has a special place in my heart. This collection of 17 poems includes black cats, four-leaf clovers, ladders, broken mirrors, the number 13 and more. So many of these were part of my life while I was growing up. I never realized how superstitious my mother was! Here is the poem that explains why I throw salt over my shoulder to this day. salt is magic. The pure kind, sea crystals. Spilled salt is magic flung wild. Throw a pinch of salt over your left shoulder. For everything, you see, there is the reverse. If you're interested in learning more about superstitions, check out the Children's Book Site Index of Superstitions. The chick-child curls up and breathes full. the firm roundness of her first home. My worst pose, or the one that causes me the greatest consternation, is tree pose. My roots are always planted on the ground. If I try to lift my leg, I feel like a tree swaying in the wind and am convinced I will fall over. While breathing through the pose I say this poem over and over in my head. One day I'm hoping these words will help me conquer (master?) it. Look—not just on a windy day. Last year as part of my April celebration of poetry I reviewed Janet's book A Suitcase of Seaweed and Other Poems in a post about poetry between cultures. You can learn more about this book at Poetry in the Classroom - Between Cultures: Part 1. Reading Rockets has a terrific video interview with Janet. You can hear her talk about where she grew up, how she came to write, and even admit that she once hated poetry! I particularly love her idea for building a poetry suitcase. You can learn about making your own in the clip below. If you want to learn more about Janet and her work, visit these sites. Janet's web site - Be sure to visit the Poems & Stories page, where you can hear Janet read some of her work. Informational page at childrensauthornetwork. - Scroll to the bottom for 10 fun facts! Hats off to Janet for participating in the Poetry Makers series. All poems ©Janet Wong. All rights reserved. Thanks for this wonderful interview with one of my favorite poets--and people. Janet is a true dynamo. I have little doubt that she could run a huge corporation. I'm so glad that she left the law and decided to spend her time writing poetry and picture books for children. Janet has given me great advice and support. I just wish she lived closer so we could talk poetry more often--and maybe share a bag of potato chips and a plate of Henrietta's red flannel hash. Janet's poems have a friendly conversational style that my students love. The most popular with my eighth graders is Behind the Wheel. I used it to create a poetry lesson to inspire boys to write poems. Thanks for another great interview. Wow! Thanks for the wonderful interview, I know it takes a lot of time on the poet and Tricia's parts. I am so impressed with this series, thanks for doing this. I consider poetry one of my weak spots in literature. Not sure how to approach it and don't read a lot of it, but this interview makes me want to know more and do more with poetry. And that tree pose can be a killer. Fabulous interview! I love what she says about writing poems during school visits and discarding them. Writing from a place of abundance--I'm always aiming for that! Her Superstitions poems are some of my favorites! Loved hearing from Janet. Thanks for all these great interviews! Nice to hear that there is hope for me yet, as a fellow ex-lawyer...great interview. Thanks! I like the poetry suitcase idea. :o) I will try that one of these days!